My best tips for keeping skin looking healthy while traveling are the same tips that will help keep your whole body staying healthy while traveling. The older I get the more I strive to keep a healthy lifestyle. I’m not a doctor or health professional so do consult one before you embark on any new exercise or health routine. Here are my best tips for healthy looking skin while traveling. Have you tried oil cleanser or moisturizer? Skip the foundation but double up on moisturizer for air travel. Airplanes are low humidity zones, somewhere around 20 percent humidity which is extremely dry. I save small containers to hold my favorite moisturizers and skin care products while I am traveling. That enables me to adhere to the rule of keeping all liquids within a 1-quart size plastic bag. I keep a 1/4 once (7 grams) container of moisturizer to put in my purse or pocket for easy access while on the plane. Moisturize before getting on the plane and if you are on a long flight re-apply moisturizer during the flight, and especially right before getting of the plane. Your skin will thank you! My favorite new night cream is Reviva Labs Glycolic Acid Cream. This stuff is magic on my skin! The label states: Exfoliation & Cell Renewal For Mature Skin. At 52 years old I suppose I qualify. I started with the 5% solution and switched over to their 10% formula after about a month. In the morning my skin looks smooth and healthy. I love this stuff! I loved the Riviva Labs product so much I bought a few moisturizers from them, alas I was not pleased with any of them. The collagen cream felt greasy, the DMAE cream and the eye complex firming cream did nothing for me. Your mileage may vary. My latest and favorite weapon against dry skin is Palmer’s Skin Therapy Oil and Palmer’s Cocoa Butter Skin Therapy Cleansing Oil. While in Calgary in winter, which is ridiculously dry, I came across a sample of Palmer’s and the results were impressive. Immediately my skin became soft and smooth. At first I thought oil based products would make my skin breakout. Turns out that oil-free skin cleansers can dry skin out causing the skin to produce more oil. While oil-based cleansers tend to be a good choice for cleansing and nourishing your skin. At Natural Grocers I found a moisturizer that works great for my skin, it’s called Andalou Naturals Probiotic +C Renewal Cream. I love the light citrus scent. It contains Fruit Stem Cells – from apple and grape. These are supposed to renew dormant cells, repair damaged cells, and regenerate healthy cells. The label states: Certified organic portfolio of superfruit antioxidants. This moisturizer is light and non-greasy on my sensitive skin. I often suffer from extremely dry skin on my hands when traveling. A quick trick to exfoliate and moisturize the hands is to grab a packet of sugar and use it as an exfoliating scrub when you wash your hands. A manicurist in Austin taught me that little trick. To keep your feet smooth and moisturized while traveling bring a pair of socks and some deep penetrating moisturizer to lather on the feet at night. Wear the socks overnight to help seal in the moisture. Several years ago I read that getting up at the same time every day helps to regulate the body’s internal clock. Once I started setting my alarm for the same time each morning I began to naturally wake up just before the alarm went off. These days I usually wake up a few minutes before the alarm goes off. When I visited Costa Rica my alarm clock consisted of howler monkeys and tropical birds at 5 am. I was surprised how quickly I adapted to the earlier wake-up time. Normally my alarm is set for 7 am. 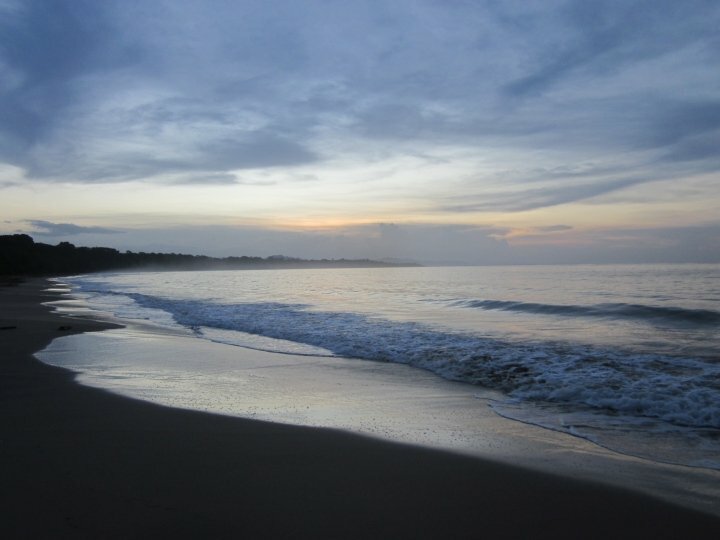 In Costa Rica I couldn’t push a snooze button to turn off the howler monkeys so I got up and walked for a couple of hours along the beach – looking at the Caribbean Sea on one side and the tropical rain forest on the other. Scientists and physicians still do not know the entire reason humans need sleep. We spend almost a third of our life sleeping, so it must be important to our overall health. I think our society underestimates the importance of a good night’s sleep. When I travel I bring my Bose noise canceling headset, inflatable neck pillow, and a sleep mask so I can sleep better on the plane. I often use the sleep mask at hotels or hostels as well. The amount of sleep we need varies from person to person, but typically the recommendation is for 7 to 9 hours of sleep per night. When I travel I find that I often sleep only 5 or 6 hours, mostly because I am a light sleeper and it takes a while to get used to the sounds in a new location. Plus I am always excited about exploring my new location when I travel so I tend to wake up early in the morning while traveling. I have noticed that my skin always looks great right after I go swimming. I swim for 1 hour, 3 times per week and even if I am dragging myself to the gym I always feel rejuvenated after swimming. The workout does wonders for my mental well-being as well as physical health. I notice my skin has a healthy glow after my 1 hour swim. For over 13 years I have been starting my day with a 10 – 30 minute yoga and meditation routine. If I skip a day due to catching an early morning flight from some faraway place, I always feel a little off. I think my decision making skills are not as sharp when I skip my yoga routine. Maintaining a healthy exercise routine while I am traveling is easy for me because I like to walk and explore my destination. On my latest trip to Barcelona I walked over 12 miles wandering around La Ribera district and Park Ciutadella. Walking at a pace of 3 miles per hour (20 minutes per mile) I should burn just over 200 calories per hour. I love to try swimming pools in foreign lands. 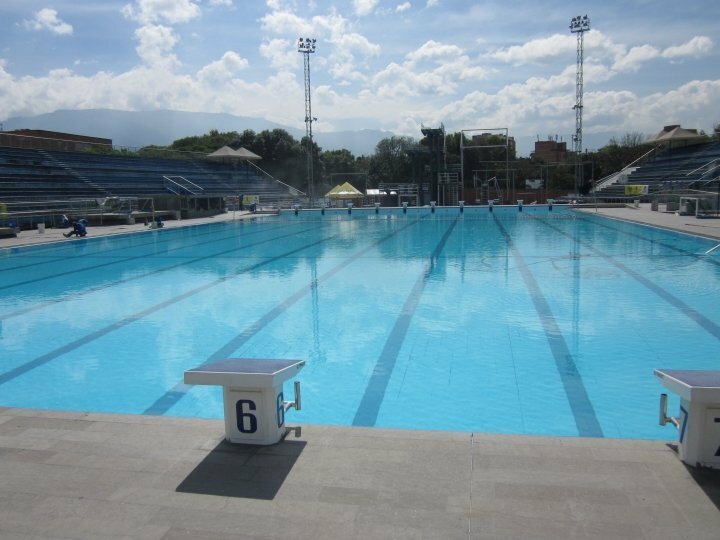 In Medellin Colombia I swam in two of the pools at Atanasio Girardot Sports Complex. In Barcelona I swam at both pools at Monjuic – the Olympic size indoor pool and the smaller diving pool outdoors. If you will be out in the sun for long periods of time remember to wear sun protection. I also like to wear a light-weight t-shirt and shorts to better protect my skin from sunburn. If you have ever gone snorkeling for a few hours and forgot to cover up you may have experienced the somewhat painful lower-bum-sector sunburn. I speak from experience! Pay attention to the old adage you are what you eat. When trying to have healthy looking skin while traveling one of the best tips is to eat a healthy diet. I like this simple rule from Michael Pollan – Eat food, not too much, mostly plants. I do follow this rule most of the time while at home. Avoid sugar and you should see an improvement in how your skin looks. Why is sugar bad for the skin? Sugar causes insulin to increase which causes inflammation and produces enzymes that break down collagen. If you want healthy looking skin you need collagen to keep your skin firm and smooth. To combat feeling dehydrated when flying I always buy a bottle of water after getting through the security checkpoint. I also ask for two glasses of water when the flight attendants are serving drinks. Keeping hydrated helps the skin to look healthier and it helps to reduce jet lag as well. Dehydration is brutal on the body. Remember the Rule of Three? The average person can survive 3 minutes without air, 3 hours without shelter in extreme conditions, 3 days without water, and 3 weeks without food. Water makes up about 60 percent of our body weight. Drinking plenty of water every day will keep you and your skin hydrated. How much water do we need to drink? According to the Mayo Clinic website men should have 13 cups (3 liters) and women 9 cups (2.2 liters) of fluids per day. I quit smoking on April 1st 2000 – around 20 years after I started the nasty habit. I consider smoking to be one of the most foolish things I have done in my life. If you want healthy skin (and healthy lungs and heart) don’t smoke! Try the nicotine patch to quit smoking, I used it to get me through the first week of quitting smoking. Smoking damages the skin because it impedes blood flow to the skin. Smoking causes premature aging of the skin due to the hundreds of chemicals introduced to your body via smoking. The risks to your heart, lungs, and skin are not worth it. I used to curse my pale complexion when I was young. My skinned burned so easily I had to wear sunscreen on my face for pretty much any outdoor activities. A couple of times during track and field days in school I finished the day with blisters on my nose from too much sun exposure. I became vigilant about wearing sunscreen and wearing a hat to protect my face from the sun. Purchasing sunscreen in other countries is sometimes more expensive than in the USA, so I always bring my own sunscreen while traveling. Neutrogena offers several of the high SPF (sun protection factor) sunscreens that are in 3 ounce bottles so I can bring them in my carry-on bag. Sometimes it is difficult to find the higher SPF sunscreens in other countries. Now my skin is reaping the rewards of avoiding the sun. I am over 50 years old but people are always telling me I don’t look my age. And a big thank you to my parents for passing down the no-way-you-don’t-look-that-old gene to me and my siblings. The older I get the more I protect my face from too much exposure to the sun and wind. A scarf is a must for any traveler simply because it is a great multi-purpose item. I have used a scarf to protect my skin from the wind and sun on many occasions. If I don’t want to wear my scarf all the time I keep it tied around my purse handle or in my daypack. On any hiking trip or boat trip a scarf is a great item to have around. If you get too hot you can wet the scarf to help keep cool or hold it overhead to protect yourself from the sun’s rays. Protecting skin from the sun and wind by wrapping a scarf loosely around the face and neck works well. 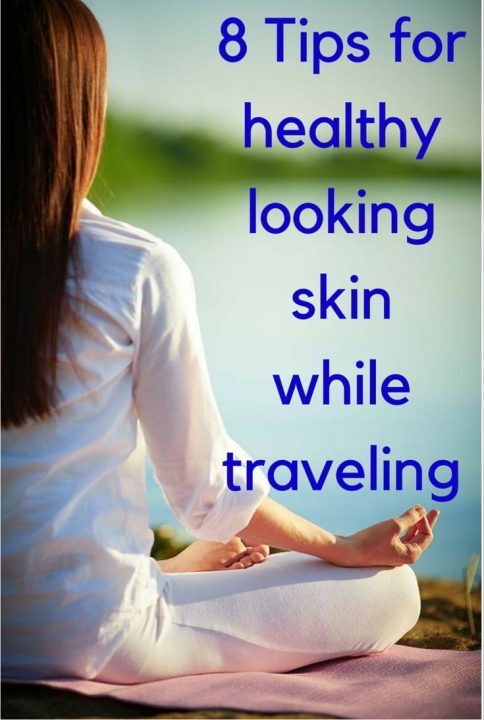 Take care of your skin and enjoy your travels! Thanks Betsy! I have the same issue with the sock trick here in Austin in the summer – no way because it’s too darn hot! I do find that my swimming habit helps to keep my feet better exfoliated, and I moisturize right after showering which helps a lot. When I wear sandals all the time my heels get dry and the skin cracks which can be painful. My very first pedicure was just a few years ago while visiting Marrakech! It was wonderful, not sure what took me so long to enjoy the pleasures of pedicures. Cheapest one I ever had was in Medellin Colombia for around $6 and it was lovely. Thanks for the terrific suggestions, Susan. We’ve put on lots of air miles recently and have really had to spread on the moisturizer, carry our water bottles and ask for extra water from the flight attendants. When we lived in the US I used to buy special sugar and salt scrubs so I can’t wait to try your tip of using plain sugar as an exfoliant – both my hands and feet could use a scrub! Wonderful tips, it always pays to be careful and be good to your body when you travel. I tend to follow your tips except moisturizing which I really should be doing regularly. As others have said, all are great tips…there is no such thing as too much water or moisturizer when traveling. My bugaboo is diet, as I find it just about impossible to turn down a great dessert…so try to make up for it when I am at home, with plenty of green smoothies. I’m good at most of those but not with the morning yoga and meditation – the snooze button was designed to make late sleepers like me even later sleepers! I’m going to check out that Reviva Acid Cream you mentioned – I’m a real sucker for skincare products! I would also (regretfully) add that cutting down on alcohol makes skin look better too (probably in part because of the sugar). Yes Kay, good point about cutting back on alcohol, it has a dehydrating effect, along with the extra sugar. Let me know how you like the Reviva cream – I was impressed with the results as soon as I began using it. All great tips, and I am a big fan of drinking lots of water and lots of walking. Great tips! I use a small, leak-proof bottle of either olive or coconut oil: apply under eyes/crows feet and on/around lips after washing your face. It absorbs well (wipe off excess) and creates a great foundation for your moisturizer and sunscreen. I also keep a small sunscreen stick in my daypack for quick application–easier to just pull it out and dab on than reapplying lotion (especially on the back of my hands and tops of my sandaled feet). Kate, thanks for the tips! Especially the olive oil or coconut oil for under the eyes – I will give that a try for sure. I could also put a little oil my heels so they don’t get so dry and start to crack. Yes, to oil on heels! Instead of socks on hot nights, I roll up a bath towel and place it under my lower calves so oily heels are suspended. Brilliant! I shall give this a try! Excellent skin care advice whether traveling or at home!! I have no trouble following your advice about using more moisturizer when you fly, but I personally have to cut back on the water or I’d be up and down to the restroom continually during the flight! I’m writing this at 2:15 a.m., so I obviously totally fail at the “get plenty of sleep” suggestion. I also hardly ever feel thirsty, so I don’t drink enough . I do use a moisturizer (cetaphil from the supermarket), but I don’t usually replace it during the day which explains my flaking skin, especially during the winter when there’s less moisture in the air. I like to walk, but I don’t walk enough. Morning yoga and meditation–nope. Not eating sugar. uh uh. Now, I’m totally depressed. 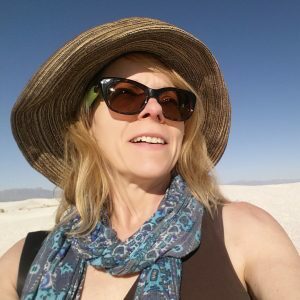 I think skin care is one of the toughest things to remember when you are traveling Susan. You’ve given great tips, especially to get plenty of sleep. After go, go going all day, I usually stay up way to late trying to catch up on my photos. It’s a vicious cycle that catches up with you quickly and manifests itself on your face! I’m going to check out the Andalon product, I love anything with a citrus scent and am always looking for sensitive skin products. Thanks for the tip.